A CDR is a new idea in the crypto space with the potential to upend global financial markets and dramatically reduce the costs incurred in the existing system of transfers and settlements. Equity and debt markets are unquestionably among the most popular and long-established markets worldwide. However, they still suffer from a number of significant drawbacks and inefficiencies, including high transaction costs (brokerage fees or expenses related to liquidity) and administrative expenses, slow settlement through the process of traditional equity ownership (from exchange delays to registration), and lots of cumbersome paperwork. To address these challenges, a team of crypto evangelists and career bankers, led by CDRX Chief Executive Officer, David Ward, have come up with an innovative idea, leveraging blockchain technology to issue Crypto Depository Receipts (CDRs), which will fundamentally change equity ownership. CDRs are essentially the crypto equivalent of American Depository Receipts (ADRs), which are certified negotiable instruments issued by a US bank (or an equivalent entity), representing a certain number of shares in a foreign company that can be traded on US exchanges. Similarly, CDRs are securitized instruments but issued on the blockchain, which mimics the traditional central share register historically used to record all data on equity ownership. The difference is that blockchain is a global immutable distributed ledger offering lower costs, faster transaction speeds, and enhanced security. Most notably, however, the use of CDRs will allow fractional ownership of stock, opening up equity ownership to a whole new class of retail investors. CDRX (http://cdrx.io) is developing a platform which will allow the conversion of shares, bonds, and derivatives into securitized tokens backed by underlying securities on a one-to-one basis. After their launch, CDRs can be further traded on CDRX’s own exchange solution or between other parties. CDRs feature all the benefits of conventional equity ownership and issuance without the drawbacks and can thus make life much easier for both investors and issuers. Apart from leveraging the high speed, transparency, and immutability of blockchain, they will help to reduce costs significantly. For instance, there will no longer be a need to conduct regular meetings of shareholders, pay numerous accountants, or maintain a share register. Many routine corporate actions can be eliminated or automated. Since CDRs are issued on the blockchain, smart contracts embedded in them will enable the automated distribution of dividends and permit online voting, drastically reducing the current costs associated with these actions (which run into millions of dollars). Besides, investors and issuers will be exempt from burdensome broker execution costs and fees since no intermediaries will be required to perform and settle transactions. Finally, CDRs will allow fractional ownership of many assets that would otherwise be too expensive for small investors. “In creating our CDR product, we have sat with investors, issuers, and regulators to address their frustrations with traditional markets. We are at the forefront of these developments, and unlike other securitized token models, direct participation from issuers is not required. Our approach leverages a proven route to securitization which, following regulatory approval, allows immediate conversion of the entire market,” CDRX CEO, David Ward said. 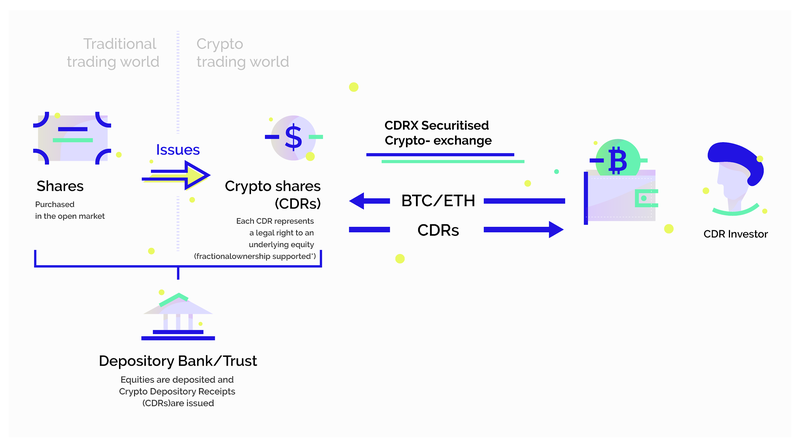 Apart from its CDR product, the global team of experts at CDRX is in the process of launching an exchange for listing and trading securitized and non-securitized crypto-instruments. The plan is to have the platform online in closed beta for the fourth quarter of 2018. CDRX plans to start with a non-securitized token-to-token trading platform, which is a reputable model that does not require regulatory approval. Further down the line, the company will expand it to include securitized tokens and token-to-fiat currencies. Overall, CDRX aims to create a marketplace where coins, tokens, and CDRs can be freely traded 24/7 and provide its users with global liquidity and high speed. Last but not the least, CDRX places particular emphasis on regulatory compliance. To achieve this, the company is already in discussions with well-regarded regulators worldwide, to be fully prepared for its regulatory obligations. This is especially important given the CDR product and its securitised nature. It is CDRX’s hope that with early compliance, a deeper partnership can be forged with the regulators - it aims to be the bellwether in this respect. Security tokens are generally regarded as a more traditional investment tool that gives holders certain legal ownership rights (eg. to company shares). Therefore, they are usually subject to the strict government regulations applicable to securities. For this reason, CDRX has prioritized full compliance and is confident that their solution will serve as a constructive intermediary step to encourage regulators to approve more progressive developments in the future. CDRX is currently open to private investors, while a public sale will be announced in the future. You can learn more about the project on their official website and join their Telegram channel for regular updates.